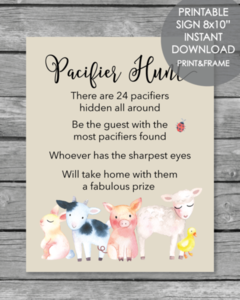 Printable Pacifier Hunt Baby Shower Game Sign - Farm Animals - 8x10"
Print, pop into an 8x10" picture frame, place on the table next to a nice prize for the game winner. Hide 24 pacifiers around the room (or rooms, depending on how big the shower is.) Have guests look for pacifiers throughout the course of the baby shower. The one who finds the most pacifiers towards the end of the shower, wins a nice prize! Save the file to your computer and keep it forever. Print unlimited copies.